Yesterday was rematch day. Same route, same opponent. Before going further I will warn you that this post has an Irish angle. I have never ridden a bicycle race and I don't think I ever will. I'm a bit past the time of life to take up competitive sports, if you know what I mean. 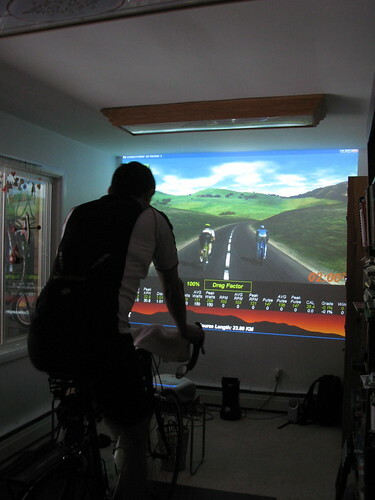 The CompuTrainer gives us a way to stay in shape once the deep freeze has set in – basically from December to April here in Ottawa. We were first introduced to it two years ago by Jim Glover of Peak Performance. We had driven down to Virginia for a one week training camp, and quickly realized that our companions were well out of our league. Jim set us up on a CompuTrainer on a rain day and we were hooked. 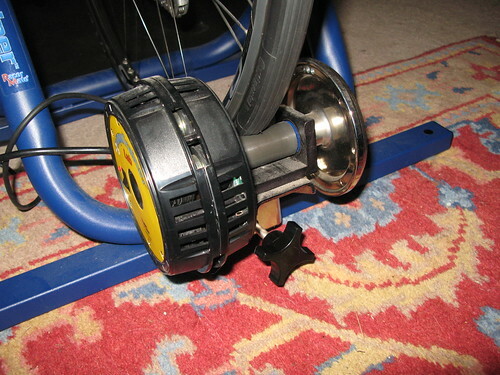 The setup is a bit fiddly – there are lots of wires, and you have to calibrate the resistance on the wheel. 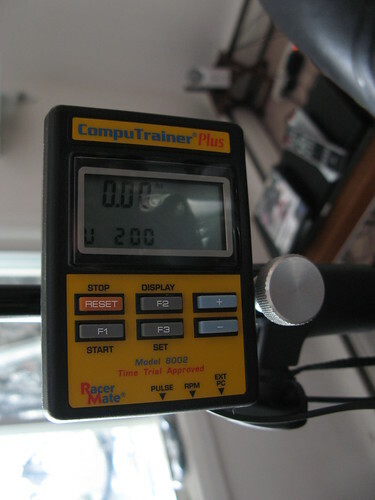 You can train on the CompuTrainer without a computer. I have never done it. The computer is where the fun begins. First, the trainer comes with software that lets you model your own course. It has lots of prepackaged courses, but I like to make my own, just because. For this route, Mary and I took measurements one day while driving back from the cottage. I have an Excel template that transforms the raw data into the required input to build the course. Once a course is built you can simply load it and start riding. 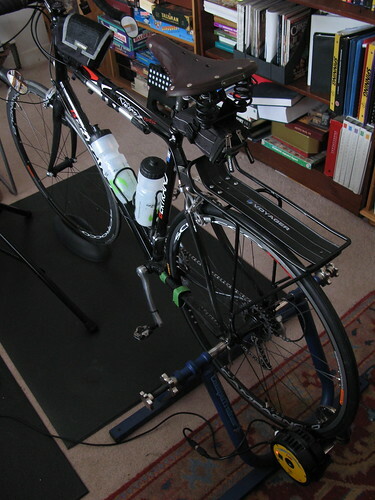 The machine measures your distance, wattage, cadence and heart rate. As the profile of the route changes the resistance against the rear wheel increases or decreases (maximum gradient of 15%). You can also chose to ride the route against a pacer, which is what I do. I specify that my Opponent, whom I will call Titanium Man (as in Paul McCartney's "Magneto and Titanium Man") will ride at a constant effort of 150 watts. This becomes my performance benchmark. There is a small detail to note here. Titanium Man has a perfect pedal stroke. I do not. So, in order to keep up with him I actually have to pedal harder, probably somewhere between 170 and 180 watts. Except I cheat. I use the "drafting" option, which lets me ride in my Opponent's slipstream at lower resistance. Yes, yes, I know – it's not quite kosher, but I'm still getting a workout. To get the benefit of drafting I have to keep within 3 to 4 meters of Titanium Man. The tricky part is cresting hills. If I'm not careful he will pull away to about 7 meters going over the top and then I'm in trouble. The downhills are a real killer, because Titanium Man keeps rolling along at 150 watts – he doesn't take a break. To keep up I have to go into really big gears, keep up the pressure on the pedals, and increase cadence. If he has put 7 meters between us I have to go even harder to catch up. This is when the heart rate really climbs. Groan. After the ride there are a bunch of performance stats that can be saved (speed, watts, heart rate, etc. etc). I don't pay a lot of attention to them but if I was serious they would be useful. The ride itself can also be saved, which I usually do. I can then reload it and ride against myself, i.e. become my own opponent. When I do this I am both a winner and a loser (a psychiatrist would have fun with this). Now comes the Irish connection. When Mary and I were cycling in Ireland last May we got a text message from Anita, our daughter who is living in Dublin. "Andy and I think we're in love." Well. Fast forward. 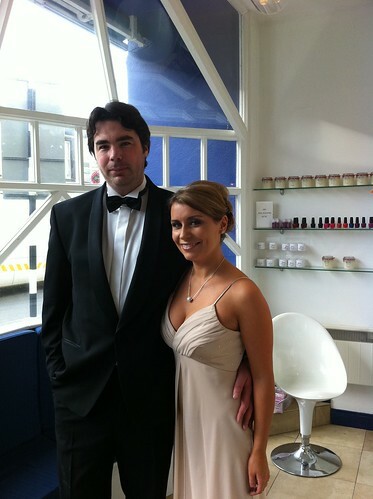 At the end of October Mary arrived in Dublin to help get things ready for the wedding. Andrew (bless his cotton socks) had a present waiting for her: a "beamer", i.e. a projector that can hook up to a computer. Nice chap. So, we now have a full screen, real time training setup, and I can watch myself be mercilessly beaten by an opponent who doesn't even spit! Except, ladies and gentleman, yesterday I pulled away with 200 meters remaining and beat him by nine-tenths of a second! The crowd went wild. Posted by Kern on December 20th, 2010. That looks like a wonderful toy Kern. I've always thought the weather here doesn't get bad enough to need a turbo trainer but I've been beginning to wonder these last few weeks. Its raining here now and I've used up all my Xmas list but if things don't pick up it could definitely be on next year's list! That looks excellent. Cycling in the comfort of home, without the fear of ice. Can you video a real-life route, and use that? But I'll bet it can't do the shopping. And the winner is... well done! I'm still kicking myself for having swallowed Tory Hill to Paudash Lake. The 'lonely road' photo – I've been wondering how your Mary came to take it at 8.30 in the morning. Kern wrote: Mary and I took measurements one day while driving back from the cottage. What sort of measurements Kern? 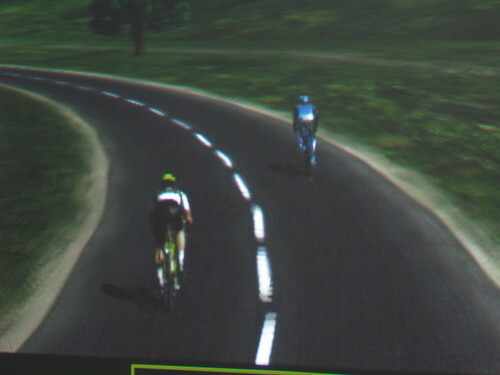 It would be good if you can feed a GPS route into the CompuTrainer and have a real road projected on the full screen. A wind machine would be great too. The last time I used a cycling machine I covered it in sweat. That's a lovely photo of Andrew and Anita. Can you drop into a pub for a beer with that machine, or tell your opponent a series of jokes?? Probably not. The effort involved may ultimately stop you using it if you are too competitive. I speak from experience. I developed a hatred of turbo trainers. I've a perfectly good magnetic one in the garage I haven't used for 10 years. Before that I had a wind-resistance one which was very noisy and then one or two rollers. The bucketing sweat was a real deterrent!! It gets cold there Garry – minus 5° winter daytime average. Patrick wrote: What sort of measurements Kern? The input for a course is a plain-text format file in which distance, gain, and wind are entered. To build the course you enter row after row of data. So for example 85, -8, 0 would represent an 85 meter stretch in which there are 8 meters loss of altitude and no wind factor. We used very sophisticated technology to capture the route: Mary drove and I jotted down numbers. I don't know whether a GPS route can be loaded. We don't have GPS (although that would make a good Xmas present, wouldn't it) but I would expect the latest software version should accomodate it. Garry wrote: Can ... you tell your opponent a series of jokes?? I can, and he laughs at them just as hard as everyone else does. For readers on these isles there is a humorous cartoon at the top of the Private Eye Christmas Special (issue 1278) that made me think of Kern – and kids today. Fear of infringement of copyright prevents me from reproducing it here – and I can't find a link on their web site. I wonder if Boxing Day will see you be burning of the turkey lunch – or whatever – on an indoor bike ride.